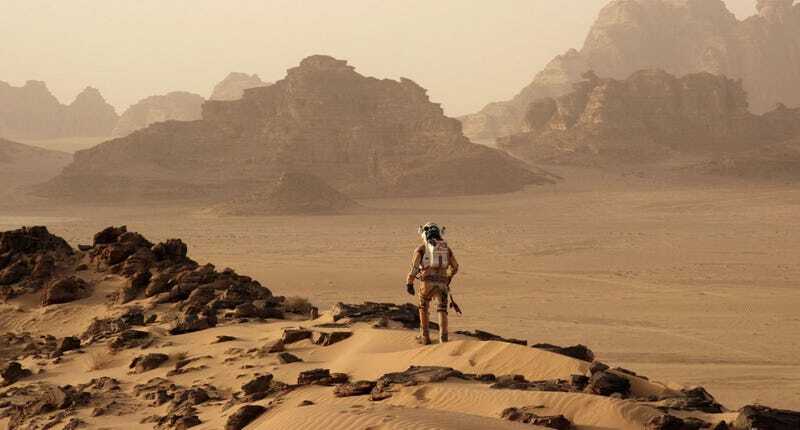 Matt Damon as Mark Watney in The Martian (2015). Mars likely held flowing water during its ancient past, possibly even vast oceans of it. Most of this precious liquid escaped into space, but some of it stayed behind, transforming into ice and settling beneath the rocky surface. New research shows that a sizable portion of this water ice is surprisingly near the surface—in some cases just a few feet down. Should this discovery be confirmed, it bodes well for future missions to the Red Planet. New research published in Science surmises that water ice exists on Mars at depths of around 3 to 6 feet (1 to 2 meters) below the surface, and extending across vast sheets measuring 325 feet (100 meters) or more. That is much shallower than what researchers have shown before. A team led by USGS scientist Colin Dundas used the Mars Reconnaissance Orbiter (MRO) to detect eight locations on the Red Planet where steep, pole-facing cliffs—some as high as 325 feet (100 meters)—appear to exhibit slabs of clear ice, exposed by the forces of erosion. That Mars still holds frozen water isn’t a revelation. We know there’s water on this planet (particularly at the poles), and radio scans by MRO have hinted at thick, buried ice located along the planet’s middle latitudes. 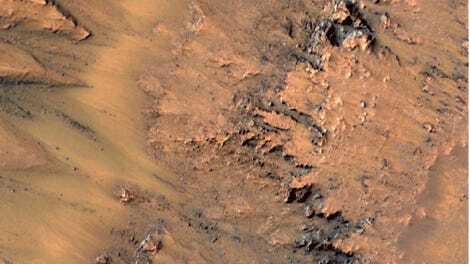 Other observations have suggested that thick mantling deposits located at Mars’ higher latitudes are indicative of a messy mixture of ice and dust, but the extent, composition, and quality of this supposed water ice has never been confirmed. This latest study may finally be the confirmation we’ve been looking for. Images captured by the MRO were taken over the course of three Martian years, or about 5 years and 7 months in Earth time. Looking at the photos, Dundas’ team saw traces of massive chunks of rock that fell from the ice due to erosion. The frozen water, now exposed to the elements, likely retreats a few millimeters each summer, but it doesn’t completely disappear. The near-surface ice and the large deposits of ice that are exposed on the surface are connected, or part of the same geological feature. No craters were seen at the surface of these locations, which means the features are likely relatively young, forming only recently. Importantly, the water ice is only visible where the processes of erosion are taking place, and the researchers speculate that ice near the surface may be more abundant than what they were able to detect in this study. And because the features contain streaks and variations in color, the frozen water is likely made up stacks, or layers, of ice. Excitingly, these layers could be studied further to help scientists better understand changes in Mars’ climate over time—and even detect signs of prior habitability. Tanya N. Harrison, a director of research at Arizona State University’s NewSpace Initiative, says this is “a really exciting paper” that provides the first direct observational evidence of the nature of the thick mantling deposits that cover much of Mars’ higher latitudes in both hemispheres. Harrison, who’s not affiliated with the new study, says this is a big deal because there’s a considerable amount of this mantling material on Mars at about 30 degrees latitude in both hemispheres—and that means there’s a lot more accessible water on Mars than we knew about before. Encouragingly, she says the spectral results mean the water is “pretty darn clean” in terms of direct content, which is great news for prospective Martian colonists. Nilton O. Reeno, a planetary scientist at the University of Michigan’s Climate and Space Science and Engineering department, told Gizmodo that the multiple lines of circumstantial evidence presented in the paper make a strong case for the presence of ice blocks bleeding through the surface of Mars, “but the paper does not prove that ice blocks exist.” Future observations should now focus on these features to confirm the findings even further. Stuurman said the most surprising aspect of this study was the discovery of exposed ice at middle latitudes. That’s because water ice isn’t stable at the pressures and temperatures found in these regions—which explains why the researchers observed it actively eroding, or sublimating. So in addition to finding the shallowest water ice deposits known on Mars, the researchers are also the first to observe active erosion of the Martian midlatitude ice scarps. But the question of water purity remains. As Harrison pointed out, the results suggest relatively clean water, but further work is required to determine purity. Excessive salinity is a potential problem that would require future colonists to bring clunky desalination devices to the Red Planet. And as Reeno pointed out to Gizmodo, the frozen water could contain perchlorates, which are toxic to humans. We simply don’t know, but it’s important that we find out. Not having readily accessible water on Mars would be a real headache, and something that could delay or slow down exploration and migration efforts, and possibly force astronauts to the poles, where ice is more readily available at the surface.